Having reviewed several turntables with speakers, we thought it wise to also narrow down to the best record players under 200 dollars which you can buy in the US, UK, Australia, as with several other countries. If your budget is within this price range, then we have selected some of the best on Amazon and eBay that come with built-in speakers, Bluetooth, USB port as well as RCA and Headphone Jacks. Thus, you do not only get a vinyl record player but one that can enable you to amplify sound externally, stream audio from digital devices through its speakers, and even digitize records to a PC or Mac. Record players were quite popular around the 60's and 70's and they still are in 2018. If you're wondering why that is, given the trends in technology that would have made a century's old electronic to become extinct, here's an insight. The set-aside record player day has created an awareness among audiophiles in the US, UK, Australia, Europe, Mexico, and several other countries, that they do not only have to rely on digital audio for entertainment. but also vinyl records. Modern turntables with a belt drive or direct drive design have an impressive level of performance. Much more, there are some that don't cost a fortune and as such, you can get excellent value at an affordable price tag. Not to derail any further, here's what we've got packaged in our guide to the best audiophile turntables under $200. A record player also called a phonograph or gramophone is an electronic device that recreates the sound that has been recorded on a vinyl record. This machine comprises of a turntable, amplifier, and speakers and in some cases, it can also come with a USB port, SD card port, RCA port, Headphone Jack, and a Bluetooth receiver. 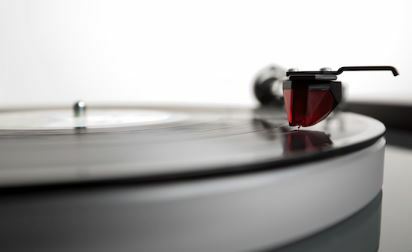 The first record player that could play the sound recorded on a disc was made by Thomas Edison in 1877. In our guide, you'll find a lot of record player parts names that may be a bit difficult to understand especially if you're just trying out this type of devices for the first time. Knowing the anatomy of a record player will also give you an insight on how a record player works. This is the area where the vinyl record is placed and it is also known as the platter or slipmat. It can be made if aluminum, steel, glass, or plastic, and then it is covered with a rubber mat to ensure that vibrations are minimized and the record does not scratch while it's spinning. This also called the needle and it can be diamond or cone-shaped. This is the component that reads the sound wave vibrations incised or impressed on the groove (surface) of a vinyl record and then transmits the vibrations it reads to the phono cartridge. The stylus is connected to the tonearm using a flexible strip of metal in order to allow it to move freely on the record groove. This component can be a magnetic or a ceramic cartridge. Generally, it is an electrical generator that translates the vibrations picked by the stylus into electrical signals. This audio signal is then amplified before being recreated as sound by the speakers. These are internal amplifiers that boost the weak audio signal received from the cartridge into a strong signal for the speakers. The tonearm is a long thin hand that holds the cartridge and the stylus and then connects them to the record player housing. In the case of an automatic pickup turntable, the tonearm can be placed automatically on the record before it plays and when the record ends, the tonearm can be removed automatically. Depending on the design, you can find a turntable with an adjustable tonearm which makes it easy to lower your vinyl records on the platter. This component can either be straight, curved, or S-shaped. Although this is not a component in all turntables, its purpose is to enable you to transfer records to a computer. You can them digitize the records to digital formats using the Software it comes with. An SD port, on the other hand, will enable you to insert an SD card into the machine and then save your records on it. An RCA Port for connecting your turntable to an external speaker such as a hi-fi system will enable you to boost its sound quality. As with other minor components of the turntable, a Bluetooth receiver helps to stream the content on your smartphone, Tablet, or Computer to the record player. Your digital audio is then played through the turntable speakers. The two major types of turntable drive systems employed in phonographs are the belt drive and direct drive turntables. This type of turntable has an elastomeric belt that connects the platter to the motor. It absorbs the vibrations created by the motor and this helps to maintain audio quality. Now, most modern record players take advantage of this turntable design due to its ability to reproduce sound that has not been tampered with by vibrations. This type of turntable can wear and tear easily since the belt can break or lose its elasticity especially if it is used for turntabalism or Djing. Moreover, they build up to speed and do not immediately play at their selected speed. In this design, the Platter is directly connected to the motor which gives a more solid build that makes this record player suitable for DJing or mixing. It can be scratched on without its speed being affected. Since they do not have an elastic belt connection, they do not break down easily like a belt driven turntable. On the other hand, they can interfere with sound due to their motor placement directly beneath the turntable. Unarguably, there are different brands of turntables on the market today and each is targeted at a particular class of user. From low-end to high-end, you'll find one that meets your needs but that would mean trying out a whole lot before finding that particular turntable. However, here are some tips on how to choose the best record player in 2018. Knowing how much you're willing to spend for a turntable will help you to choose one that meets your requirement and at a good price. Think beforehand if you want a turntable under 100, 200, 500 or even above 1000 dollars. So that in the end, whichever you settle with will be your best buy because it's no use spending more for a machine whose extra features you may not use. Belt-drive and direct-drive are the major drive systems employed in record players. While each has an advantage over the other and comes with its own downsides, they are most suited for certain uses. A belt drive design uses an elastic belt to connect the platter to the turntable and this belt acts as a shock absorber for vibrations and other low-frequency interference to prevent them from being read by the stylus. An advantage of a belt driven turntable is that audio quality will be maintained without being affected by motor vibrations. On the other hand, this type of turntable is not suitable for Djing since the belt will easily break if the record is scratched on or during mixing. In that case, a direct-drive design will be more suitable since the platter is directly connected to the motor. Turntables made of Aluminium can reduce vibrations due to their heavy weight which makes them very stable. Steel turntables are more susceptible to the effects of motor vibrations since they are lighter. And as such, an instability in the motor speed can have an effect on the reproduced sound. Modern record players do not only come with an amplifier, turntable, and speakers, they also have additional features. Some of these include USB/SD port, RCA port, Headphone Jack, Aux input, as well as a built-in Bluetooth. Thus, your best buy record player for under $200 should come with some if not all of these features coupled with its major components. There are several turntable reviews on Amazon affiliate sites as well as user recommendations on Amazon you can use to determine the quality of a record player. In each case, you'll get to know its perks and downsides and then use it to judge if it is a machine that's worth your hard-earned money and even more. So, what can your $200 get you? The best affordable record player with built-in speakers, USB, and even more features. Below, are some of the best vintage record players under 200 dollars that can give you decent sound quality. They have a durable to ensure that you get excellent value for your money and for a long time. 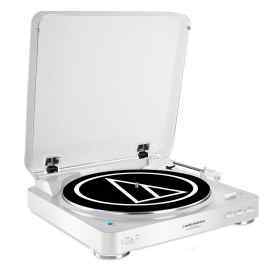 Thus, it should not come as a surprise that the Audio-Technica AT-LP60WH-BT turntable has made the list as with several other review guide list on the net. If you don't know this already, Audio-Tecnica is a Japanese company that specializes in the design and manufacturing of headphones, microphones, phonographic magnetic cartridges, as well as other audio equipment, and that has been the case since 1962. That being so, this is a reputable brand you can pitch your tent with. Here's what you should know about the AT-LP60WH-BT. The AT-LP60WH-BT turntable from Audio-Tecnica has a solid and premium design that makes it a perfect fit for your room decor. A dimension of 18 x 6 x 16 in and weight of 8.5 lbs gives it a compact and small size. You can move it around with ease, thereby changing its placement on a desk, table, or shelf. Its Platter is made of aluminum which makes it heavy and very stable which in turn helps to minimize vibrations caused by the motor. As a result, you can expect quality sound output that is not interfered with by vibrations. There is also a removable hinged dust cover to protect the turntable from dust whether it's in use or not. The AT-LP60WH-BT operates automatically when a vinyl record is placed on the turntable. This means that the tonearm is automatically lifted and the stylus is placed on the record, and when the record ends, the tonearm is returned to its position. Speed settings supported by this record player are the 33-1/3 and 45 RPM which is the same as the AT-LP60, AT-LP60-USB, and AT-LP3. This turntable is belt driven and as such, you'll find its platter and motor connected by a belt that serves to minimize vibrations. Accordingly, this makes for a more enhanced sound not interfered by vibrations or other low frequencies. You'll find a dual magnet phono cartridge with a diamond stylus connected to its tonearm, and this stylus or needle is replaceable. 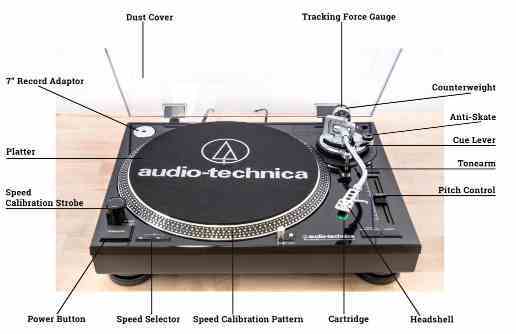 Asides having the basic features of Turntables, additional ones that you'll come to like are its RCA port and USB port. While the RCA output will enable connection via cables to an external sound system to further boost its sound, the USB port will allow you to digitize all your records. The Bluetooth wireless connectivity of this record player makes it possible to connect to up to 8 speakers, headphones, and other Bluetooth enabled devices at a time. For quicker connections, all you have to do is store each of these device's in the AT-LP60-BT's memory and at a simple push of a button, you can connect to each of them. 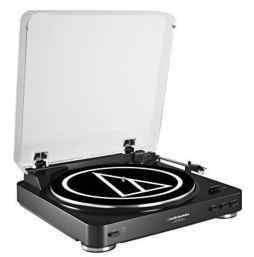 Like the AT-LP60-BT, the Audio Technica AT-LP60BK-USB fully automatic belt-drive stereo turntable is another portable record player under $200. At about $129, it is less expensive than the AT-LP60-BT, but it can still offer excellent audio quality. That being the case, if you want a Turntable from the same brand while you save some extra bucks, this variant would also be a good choice. As already stated, this is a portable turntable judging from its dimension of 14.02 x 14.17 x 3.84 in and weight of 8.5 lbs. Consequently, it still maintains a small build as its other variant and as such, you can also move it around with ease. You'll also find a removable cover that serves as a protection against dust mounting on the turntable. Its anti-resonance and die-cast aluminum platter help to prevent motor vibrations from being read by the stylus. The AT-LP60BK-USB is a fully automatic turntable that places the tonearm on the record and also lifts it automatically once the record ends. It supports both 33-1/3 and 45 RPM records but there 's not third speed setting as is the case with some modern turntables. Nevertheless, since you don't have only one speed to rely on, you can control the speed to meet your needs. There is a USB output on this machine coupled with a recording software to enable you to convert all your vinyl records to digital files. Your favorite records are closer than you think thanks to this feature. They can be stored on your phone, Tablet, Windows PC, and several other devices in digital formats. It's RCA output makes it possible to connect via cables to an external home music system, powered speakers, or computer in a bid to boost the sound levels. You get a dual magnet phono cartridge with a replaceable diamond stylus and an inbuilt switchable phono pre-amplifier as part of its components. The Goodnew vinyl record player turntable is another contender on the list of the best turntables under 200. What does this turntable offer? 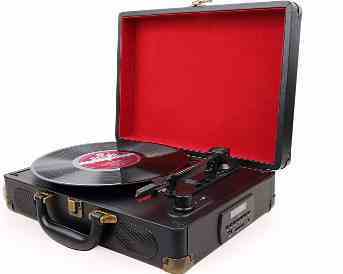 This is also a portable suitcase record player that can be taken on the go. If you want something you can pack up at any moment and be on your way, then you may come to like the Goodnew vinyl record player. At a dimension of 16.5 x 13 x 6.5 inches and weight of 7.3 pounds, it does not weigh a ton or feel like an extra load to carry around. Its external build is durable which will ensure it'll stand the test of time. According to its maker, this is fine workmanship coupled with durability. The Goodnew vinyl record player is a belt-driven turntable that can reproduce quality sound since the design of its turntable uses an elastic belt. This will tend to absorb the vibrations and other low frequencies that may be produced by its motor, thereby preventing its Ruby stylus from reading them. It has a built-in auto ON/OFF switch that when turned on, automatically stops the record when it has played to the end. This turntable also comes with a Bluetooth receiver which will enable you to play songs from a Bluetooth enabled device such as an Android or iOS smartphone, Tablet, Computer, etc. through its speakers. There are two front-facing speakers built into this machine, and their placement makes for a more detailed sound. Speed settings supported by this vinyl music player are 33, 45, or 78 RPM and it is suitable for vinyl records that are of 7, 10, or 12 inches. To enable you to set up this Suitcase turntable player with ease is a user manual packaged alongside with it. Now portability aside, one more record player that can deliver quality sound coupled with several other features you'll come to like, is the D&L vintage wood 7-in-1 Bluetooth turntable. If you're looking for a turntable to travel it or move around every once in a while, this would not be it given the bulky size of this wooden nostalgic record player. Features it comes with makes up for this downside and there's even its sleek design to make it one of the best buys out there. That is to say, this is an all-in-one vinyl record player that will not only play your records but can offer so much more. This is 7-in-1 Bluetooth Turntable that has other features packaged into one machine. 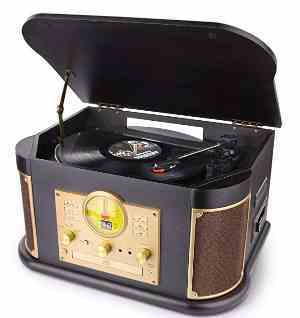 It is a 3-speed turntable that supports 33, 45, and 78 RPM records. Not only limited to records, it can also serve as a CD player or a cassette player, thus, this is a multipurpose music player. 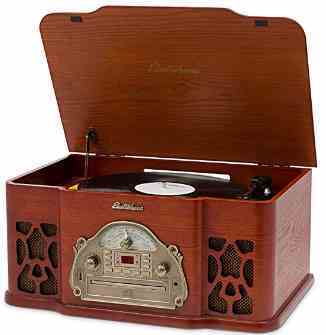 If you're looking for a record player under 200 with an FM/AM radio, this would be it. Accordingly, you can tune into your favorite channel to get the latest gist flying around if you'll rather not play your own records. There's also a built-in Bluetooth that will enable you to stream wirelessly from a Bluetooth enabled device to this turntable at a distance up to 33 Feet. You get a 3.5mm AUX input jack that will enable you to play songs from a non-Bluetooth device. A USB port, as well as an SD port, has been made available. While the former will enable you to transfer your records to a Computer, the later will enable you to insert an SD card in a bid to save your records. To amplify sound either using a headset or external speaker, you'll find a headphone jack or an RCA jack you can make do with. The Goodnew vinyl record player comes with a replacement stylus needle in case there is a need to change the current one. The Electrohome Wellington retro vinyl turntable ((EANOS502) is an affordable record player given its price tag of about $140 dollars. It is designed and manufactured by Electrohome, a Canadian manufacturer that has been producing Record players, Clock radios, Karaoke and other high-quality audio products for the past 100 years. This machine has the features of a modern stereo system, but comes with an old-fashioned look. If you want an old music player that actually looks like its a few decades old but with a solid build, this would be one. It has an amber lighting on the analog tuning dial, rotary control knob, and an antiqued patina faceplate. Handcrafted with real wood and has a rich mahogany finish. Alternatively, its large size may not go down well with some people and for this reason, you have to prioritize between size and functionality or you can make do with the more portable archer vinyl record player from Electrohome. Alternatively, if its dimension of 12.6 x 19.29 x 9.1 in and weight of 16.3 lbs is not a lot to deal with, then this would be another machine to give your utmost consideration. Asides that, it has a solid and sleek build like that of the Winston vinyl record player. The Electrohome Wellington record player is a 4-in-1 classic turntable system that can be used to play vinyl records, CD’s, and AM/FM radio. You can also convert your records to MP3 and transfer them to a portable USB drive without using a PC. This is a belt driven turntable that is able to minimize vibrations in order to give warm and quality audio sound. Its conical-shaped sapphire tipped ceramic stylus ensures that the surface of your vinyl is not scratched while the record is spinning. Its mode of operation is fully automatic and that being the case, the stylus is automatically placed on the record's groove when the tonearm is lowered, and when the record ends, the tonearm is removed. This cabinet vinyl record player supports records of 7, 10 or 12 inches and its pitch can be controlled with speed settings through 331/3, 45 & 78 RPM. To further amplify its sound other than using its 2 front facing speakers, you can connect an external speaker to its RCA port. Moreover, its AUX Input for Smartphones, Computers, and other devices enables you to play sound through its speakers via a wired cable connection to the turntable. Also do well to watch this video review of the Electrohome Wellington 4-In-1 nostalgia Turntable. In our selection process for the best turntables under 200, several factors were given utmost consideration. This enabled us to narrow down to only 5 of the best that are affordable and can provide an acceptable level of performance. Being limited to the best record players for under 200 dollars, the scope of our research was not a broad one. Nevertheless, we knew which products we were after given their price tag and we were able to use them to compare with other products in the same price range from different brandss. In the end, these ones held a lot of promise. Arguably, you may not need these turntables for DJing and as such, a belt driven turntable would be a better choice if you want a turntable you can use at home, school, office, or while traveling. This kind can minimize vibrations produced by the motor which will, in turn, ensure that the sound produced is clear and crisp. While its good to find a high-quality record player for your vinyl records, its even better if it also comes with features such as RCA and headphone Jack, Bluetooth, USB/SD card port. You'll find record players we've selected with some of these features if not all. Others like the Wellington record player can even be used to play CDs and Cassettes. Having gone through the reviews of hundreds of buyers on Amazon who have already purchased the same product, we were able to determine their real-life operation. That is to say, their limitations and capabilities were taken note of to judge if their perks greatly outweighed their downsides. Our selected few were quite impressive. These are the best record players for under 200 dollars that can offer a crisp and clear sound while at the same time enable you to plug into an external speaker to get better audio quality. For their price, they can give you excellent value for your money. So, it's left for you to take the next step to recreate the multimedia experience of the 60's in your home, office, or business by buying one of these turntables from reputable online stores like Amazon, Walmart, and eBay.